Excellent choice, the young man has a taste definitely. I want to give a quick shoutout to @Jeff-TheBiz for giving me an awesome first car buying experience. 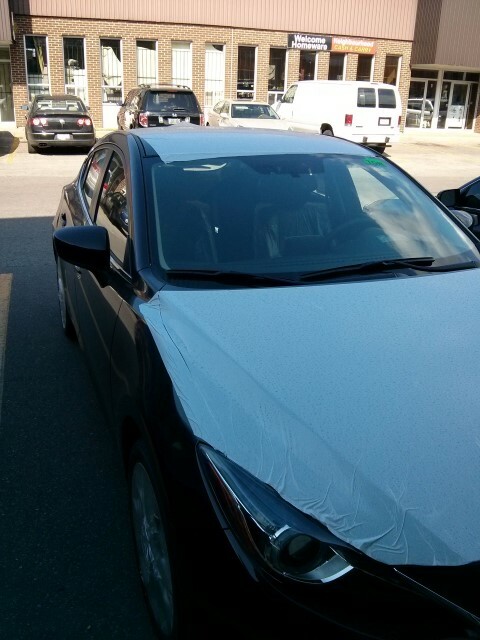 Today I picked up the Mazda3 GT 2015 Sport in black with all the shipping plastic still on as requested via email. Drove it right over to Hamza @ Get Detailed for new car prep & coating, so will give feedback on that experience when I pick the car back up from him. A dealership that also gave great pricing with minimal effort was Achilles Mazda via CarLadyLisa & Achilles. Its unfortunate that their location was much further from me than MoT, as I thought they were also very informative and great to deal with. If anybody is on the fence about talking to Jeff, definitely give it a go! Thank you so much for the business Percy. Let me know when Hazma is done with it so we can put on those scuff plates. This is pretty late, i purchased my car around February or march, and i must say. Jeff is the best. It is better not to disclose so much on the internet, just go and visit jeff from Mazda Toronto. What are you worried about disclosing over the interwebs? I've been looking for a car casually for awhile now. I started getting more serious in the last two weeks when I heard about Jeff. I thought I'd give it a shot, I already had few quotes with me when I made an appointment with Jeff. I also booked 2 more appointments after the one with Jeff. I walked in to MoT, sat down at Jeff's desk, within 2.5min I got a quote that was better than anything I had up until then. No haggling, no BS, no pressure of any kind, he was not trying to sell me any of the services you don't need, just straight up transparent quote with a good deal. I was so impressed I immediately canceled my other two appointments. Couple of email dealers were a bit harder to shake off, but their offers could not come close to Jeff's. I was so impressed I immediately recommend Jeff to a buddy of mine who is buying a second car, and I talked him into getting a Mazda 2 from Jeff. I picked up my 2016 MZ6 GS with Luxury package from Jeff early summer. this review was long overdue. You do encounter people in your life that leave a lasting positive impression, Jeff is one of them. I did my research on 5 different dealers, but they could not match the conditions and the price for the car. And the foremost thing when putting in such a huge money, the convenience of not being ripped off and the ease of everything being authentic....HATS OFF to JEFF. Thank you Jeff for making is very very easy, truthful and an enjoyable purchase for me and my family. You are a true gentleman and a honest person. I shall see you soon at MoT. Cheers buddy. Do not hesitate to contact me if you ever need anything. Big shout out to Jeff (TheBiz) for helping me get my parents into a CX-3 GS! It was a great experience from the first phone call to the pickup this past Saturday! This is the 3rd Mazda that I've arranged with Jeff over the years. edit...The thread title should be 'more praise FOR Jeff @ MOT'. I guess my fingers aren't awake yet on Monday morning. I want to offer my thoughts on an amazing car buying experience with Jeff. I picked up my 2016 Mazda 3 GT sport last week. I spoke to Jeff a month ago and within minutes he gave me a no nonsense, no BS quote over the phone. I had been planning on waiting until my current lease was over in the summer, but the deal Jeff gave plus Mazda rebates were too good of a deal to pass up. So after a little contemplation, I called him back and made the order three weeks ago. Jeff initially thought there would be no problem getting the car, but it turns out a Mazda 3GT sport in red without leather is a bit hard to find and 48 hours later he told me he couldn`t find it, but would see about ordering a new one. A day later he pulled off a little magic and found the exact car I was looking for. After driving a civic, Acura, a couple BMWs, Scion frs, this is my first Mazda and the first impressions are GREAT- the perfect balance of fun, refinement with a little practicality. I couldn`t be happier. PS - you know the difference between a successful business man who you want to work with and a loser disguised as a businessman (you know the ones that think they can pull the wool over your eyes). The successful ones don't say 'no we can't do that' when they run into a snag, they always look for a way to make it work. That's what Jeff did. Of course when we first spoke he was confident we'd find the right car, but when we ran into a snag, instead of saying 'sorry we can't get it' or trying to convince me to get something else, he said 'lets see what we can do'. And that's exactly what he did, he found the car through another channel. Anyways Kudos to you Jeff. It's no mistake that you get all this praise. You deserve it! Thank you so much for the kind words Eric, let me know if you need anything. Thanks for your patience Jeff, the Mazda 6 GS-L was a great deal and love every bit of this car. Just wanted to second everyone's comments here about Jeff, we went to see him last night and we bought our car (shh its not a Mazda 3... though we did have one for 10 years). Jeff is fantastic to deal with! No sales tactics, we just had a conversation and walked out buying a car... awesome! Sadly I no longer have my Mazda 3 anymore after my lease ended. It's time to now sell our 2006 Mazda 5 GT now and move into a newer vehicle. Worked with @Jeff-TheBiz to purchase a CX-5 GT with Tech and it finally arrived after being custom ordered. As usual, the process was a great experience and we got a great deal. Thanks Jeff. New CUV looks great in Crystal Soul Red with the black TM3 plate covers. Just need my Ride properties changed on my profile now. Last edited by SonicBoy; 08-09-2017 at 09:35 PM. What was custom ordered on the cx5 ? Living dangerous with the White leather which no dealership had in stock. How long is that going to take to arrive? Only took 9 weeks and yes those were very long weeks! I bought my first car this past Monday thanks to this forum and its recommendation for Jeff. Everything was done by email and this last Monday I went into meet him and pick up my car.. Enjoy your car and thank you so much for your business. email and talked to Jeff to get a 2019 Machine Grey CX-5. Got it in 12 days as it had to be brought from BC. Love the ride so far.